PORT ST. LUCIE, Fla. – What seemed remarkable was really just another day at the office for Maine Diamond Dogs right-handed pitcher Marc Powers. After coming within two batters of a perfect game in a semifinal win over perennial powerhouse Fedlock a day earlier, he retired the final 22 batters in a row in that win, Powers tossed a complete-game, four-hit shutout against the defending champion Suncoast Suns as the Diamond Dogs claimed the 45+Wood National crown at Digital Domain Park. For his efforts, Powers was named the tournament’s Most Valuable Player. Maine scored a single run in the second inning before adding two more in the fourth and one more in the sixth to complete to 4-0 final. The victory avenged an 8-5 loss to Suncoast in the first round of last year’s tournament – which was eventually won by Suncoast. Powers, 46, throws from a low three-quarters arm slot, which he developed while at the University of Maine in the mid-1980s. His running sinker, mixed with a sharp slider helped keep Fedlock and Suncoast off the scoreboard for 18 straight innings. 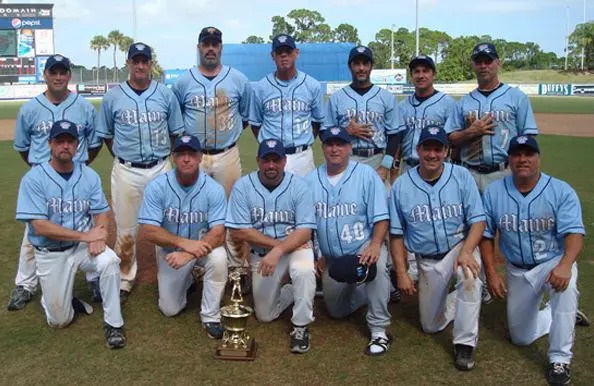 The Diamond Dogs won the semifinal and championship games without the services of former NFL quarterback Doug Flutie, who had to fly out for the weekend due to network television commitments. Still, Flutie did his part to help an undermanned Maine squad get off to a solid start in the tournament as he was the winning pitcher in a 9-4 opening day win over New Jersey.